After taking a look at our chart of the best metal amps, we decided to remove two models – the Blackstar HT Series HT-1 and the Bugera Trirec. However, these were replaced with two excellent amps for metal – the solid-state Line 6 Spider V 60 and the all-tube Orange Dark Terror. From neoclassical to industrial, death to thrash, djent to speed, the world of metal is loud, brash and utterly awesome. It’s a style that truly pushes guitarists, guitars and gear to the extreme. What Makes a Great Amp for Metal? Should You Go for a Tube or Solid-State Amp? Why Not Just Use Effects Pedals? But having an awesome high-end axe with powerful active humbuckers won’t cut it if your amp isn’t capable of delivering the insane overdrive and articulation that metal requires. Which is why a dedicated metalhead needs a dedicated metal amp. Of course, you’ve come to the right place, as we have put together a short rundown of some excellent guitar amps that are ideal for hard rock and heavy metal. We’ve highlighted some true legends, as well as some awesome affordable amps worth considering. Stick around after the chart where we take a closer look at what makes a good metal amp and what to look out for when shopping for one. The prime source of Eddie Van Halen's pure, legendary brown guitar tone. 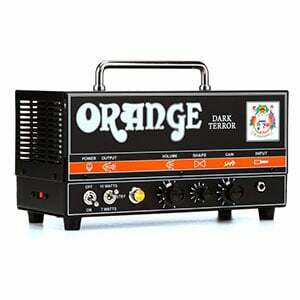 By far one of the most popular and capable metal amps available. A neutral choice for those who appreciate a more old school tone. Cute and compact with a deadly tone. Smaller version of the legendary 6505 that brings the same amazing tone. If there is one name that has made an impact on the world of high gain guitar sound, it is Eddie Van Halen. Therefore, when a guitar player of his caliber designs a perfect amp according to his needs, we listen. EVH 5150III is an awesome little tube head with vast supplies of gain ready to be used. It is an all tube design that features three separate channels, and just an impressive tone. What really makes the EVH 5150III a really special treat is that classic EVH 'brown tone' that. Gain management is easy, intuitive and really allows you to dial in the type of sound you're looking for. Overall, this amp is about as good as it gets. Peavey's 6505 easily the most popular choice for metal guitar players around the world. There's several reasons for that. The most obvious one is the copious amount of gain this thing can dish out, which attracts the extreme metal crowd. Pretty much any humbucker you plug into this bad boy will scream with heat. The formula they have used has proven to be just the kind of thing necessary for a good metal sound. Since it is an all tube amp, you can expect to distortion to be organic, full and highly flexible. Peavey's 6505 series of amplifiers are by far one of the best things you can get if metal is your main genre of music. That's a fact. If we were to go back to the early days of metal, we would see that a large number of guitar players used standard Marshall heads. Something like this Marshall DSL100H is a genuine, old school way to get a proper metal tone. Especially considering that you get three dirty channels, including classic crunch. It is arguable that OD2, where most of the gain is available, is something that's going to be used the most in metal music. Overall, without any additional effects, Marshall DSL100H can get you into quality trash or heavy metal territory without even breaking a sweat. Additionally, since it packs 100 Watts of pure heat, you are looking at a very capable gigging piece of gear. Despite being simple, small and portable, there is nothing lightweight about this all-tube amp head from Orange, which delivers ultra-high gain that’s perfect for pretty much any style of metal. The Dark Terror – part of the brand’s famed Terror Series – is a low-wattage single-channel head, offering 15 watts (switchable to 7) of power driven by two EL84 power tubes, three 12AX7 preamp tubes and an 12AT7 tube driving the serial effects loop. While the cleans aren’t as pristine as some may require, the gain is sensational and there’s enough power for any small to medium-sized gig, while it is wonderful in the studio. There’s more on this amp in the https://www.guitarfella.com/orange-dark-terror-review/full review of Orange’s Dark Terror. Peavey ValveKing II is special in a number of ways. Usually when a brand decides to develop a smaller version of a popular amplifier, they either limit it's tone in some ways, or do something else to create a hierarchy between the two. Peavey pretty much disregarded that approach, offering an almost identical performance of the full size 6505 in a much smaller, and more importantly, affordable package. The tone is there, as is the headroom when it comes to gain. The only real difference between the standard 6505 and this mini version is the power output. Everything else is more or less the same. Needless to say, Peavey has acquired quite a few new fans with this model. Perhaps one of the most common questions people getting into metal tend to ask is whether there is such a thing as a guitar amp designed specifically for metal. And it’s a good question! Technically any decent amp should be able to deliver the goods, but – as you will have seen on our chart above – there are some amps that excel at metal. These amps share some traits. For example, the amount of gain on offer. Highly-saturated overdriven tones, chunky rhythms and searing hot leads define the metal genre, so a good metal amp will be able to offer the most aggressive, face-melting distortion you can imagine, while still remaining clear, punchy and articulate. While you can play metal on some good all-rounders, that also catering for a wide range of styles (i.e. clean, vintage, blues), these amps rarely offer the extreme metal sounds a dedicated metalhead would need – especially if it’s not a modelling amp. Of course, the age-old debate over tube amps and solid-state amps extends into the world of metal. While the difference between the two is far less noticeable in this genre, that doesn’t mean it’s non-existent. The majority of amps in our chart are tube amplifiers, which suggest tubes deliver a pretty great metal tone. This is true as they deliver a rich and full overdrive that sounds warm and natural and is very responsive to your playing style, while still being able to go insanely heavy. If you have the money and experience, a tube amp is well worth exploring. However, solid-state amps can also deliver a tight, aggressive and consistent metal tone and are preferred by many guitarists. In addition to the severe metal tones on offer, solid-state amps provide guitarists with other benefits including the fact that they tend to be cheaper, lighter and easier to maintain. But there is no right answer – the choice will come down to you as the guitarist, based on your style, your budget and your preference. Guitarists will know that you can also use both multi-effects pedals and dedicated metal pedals to achieve some insane metal tones. In most instances you can combine a good amp and a decent pedal to achieve an awesome tone, but – as good as some distortion pedals are – they still fall a little short of the tone delivered from a devoted metal tube amp that’s saturated with gain. For the best tone, use effects pedals to complement a good amp, not instead of. Don’t judge a book by its cover – just because an amp boasts an epic overdrive channel doesn’t mean it can’t be used for anything other than metal. In fact, most of the models we have listed in our chart are perfectly suitable for a wide range of music, from blues to jazz (providing you turn the gain down first!). One thing worth noting is that some of these metal-oriented tube amps may not offer crystal clear clean channels. After fiddling around with the volume and tone settings on both the amp and guitar, you can certainly find very acceptable cleans, but usually there will be some grit to the sound. If you are keen to play country and jazz alongside metal – or just want pristine clean channels for certain parts of a song – a solid-state modelling amp may suit you better than some tube amps. So, whether it’s Metallica, Meshuggah, Babymetal or Rammstein that floats your boat, the models we’ve highlighted above should at least give you some inspiration when shopping for a suitable metal amp. Every guitarist’s taste is different, so get out there and find the tone that suits your playing style. Don’t just settle for the first amp that comes along – your journey to finding the perfect metal tone might end up being a long one, but nothing is as good as the feeling you have when you do.